A field study techniques day covers the methodology and skills required to undertake an investigation into two of the following four options: sand dune succession or management and coastal or river processes. Work is focused more on the techniques and methodology used in the field rather than the investigation of issues or the testing of hypotheses. Approximately 2-3 hours are available for working at each of the two sites. This study investigates the coastal processes operating along the Sitges coast. Evidence for longshore movements and dominant wave directions can be gained through a study of pebble long axes and alignments. Comparisons can be made of shingle and sand beach profiles. Flash flood hazard and river management. The Riera de Ribes is normally a dry river and the investigation is based on a historic flood notch on a river cliff. The river flood cross-section and gradient are measured. Discharge is calculated using the hydraulic radius and Manning n formula. Bank-full cross-sections downstream allow the risk to recent housing and camp site developments on the river floodplain to be assessed. This fieldwork investigates the threats to fragile sand dune ecosystems along the coastline to the southwest of Barcelona. It examines the impact of human activity and the variations in biodiversity between managed and unmanaged dunes. The construction of the Gav� coastal walkway aims to protect the dune ecosystem mainly by reducing extensive trampling. Landscape architecture must deal with the abiotic and biotic processes of the dune system and the Gav� coastal walkway has been developed to achieve these goals. 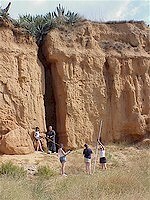 Contrasts may be drawn with the protected sand dunes at the nearby Llobregat Delta Nature Reserve. Access is restricted to permit holders and field visits are not possible during the Spring nesting season.